Iowa opens the season at home against Eastern Illinois. 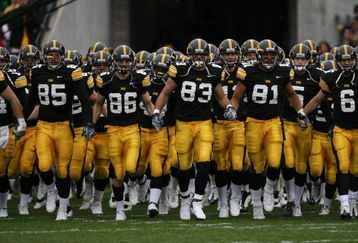 Last year in their opener against Northern Iowa, the Hawkeyes trailed 10-3 at halftime. The coaching staff sweated bullets. These Northern Iowa Panthers were not patsies. In the third quarter Northern Iowa extended their lead 13-3. Stanzi’s back was against the proverbial wall when he marched the offense 70 yards in six plays to score, reducing Northern Iowa’s lead to three. The reinvigorated offense under Stanzi’s leadership took charge in the fourth quarter. Tony Moeaki caught a six yard pass to change the score in favor of Iowa for the first time 17-13. With 13 minutes left on the clock, all Iowa had to do was hang on for a win. But Iowa never did things the easy way––at least not in 2009.